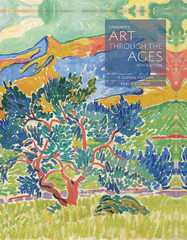 Gardnerâ€™s Art through the Ages 15 Edition GARDNER'S ART THROUGH THE AGES: A GLOBAL HISTORY provides you with a comprehensive, beautifully illustrated tour of the world's great artistic traditions! Easy to read and understand, the 15th edition of the most widely read art history book in the English language continues to evolve, providing a rich cultural backdrop for each of the covered periods and geographical locations, and incorporating new artists and art forms -- all reproduced according to the highest standards of clarity and color fidelity. A complete online learning environment, including all images and an eBook, also is available. The unique Scale feature will help you better visualize the actual size of the artworks shown in the book. "The Big Picture" overviews at the end of every chapter summarize the chapter's important concepts.